As of the census of 2000, there were 66,616 people, 25,021 households, and 17,364 families residing in the county. The population density was 23 people per square mile (9/km²). There were 30,407 housing units at an average density of 10 per square mile (4/km²). The racial makeup of the county was 83.63% White, 0.26% Black or African American, 0.99% Native American, 0.68% Asian, 0.12% Pacific Islander, 12.19% from other races, and 2.14% from two or more races. 19.26% of the population were Hispanic or Latino of any race. 16.9% were of German, 11.2% English, 9.3% United States or American and 7.1% Irish ancestry. 80.9% spoke English and 18.1% Spanish as their first language. There were 25,021 households out of which 34.50% had children under the age of 18 living with them, 56.40% were married couples living together, 8.70% had a female householder with no husband present, and 30.60% were non-families. 25.10% of all households were made up of individuals and 10.80% had someone living alone who was 65 years of age or older. The average household size was 2.62 and the average family size was 3.14. In the county, the population was spread out with 28.00% under the age of 18, 8.30% from 18 to 24, 27.20% from 25 to 44, 22.70% from 45 to 64, and 13.90% who were 65 years of age or older. The median age was 36 years. For every 100 females, there were 99.10 males. For every 100 females age 18 and over, there were 96.80 males. The median income for a household in the county was $37,316, and the median income for a family was $46,293. Males had a median income of $35,065 versus $25,838 for females. The per capita income for the county was $19,273. About 8.80% of families and 12.40% of the population were below the poverty line, including 16.00% of those under age 18 and 7.40% of those age 65 or over. As of the 2010 United States Census, there were 72,453 people, 27,827 households, and 18,795 families residing in the county. The population density was 24.8 inhabitants per square mile (9.6/km2). There were 35,465 housing units at an average density of 12.1 per square mile (4.7/km2). The racial makeup of the county was 79.3% white, 1.0% American Indian, 0.8% Asian, 0.3% black or African American, 0.1% Pacific islander, 15.7% from other races, and 2.7% from two or more races. Those of Hispanic or Latino origin made up 25.8% of the population. In terms of ancestry, 17.6% were German, 15.0% were American, 11.3% were English, and 8.3% were Irish. Of the 27,827 households, 32.4% had children under the age of 18 living with them, 52.7% were married couples living together, 9.7% had a female householder with no husband present, 32.5% were non-families, and 26.3% of all households were made up of individuals. The average household size was 2.57 and the average family size was 3.10. The median age was 39.3 years. The median income for a household in the county was $48,674 and the median income for a family was $57,856. Males had a median income of $41,076 versus $34,261 for females. The per capita income for the county was $24,378. About 8.2% of families and 11.5% of the population were below the poverty line, including 16.8% of those under age 18 and 9.0% of those age 65 or over. ^ "Find a County". National Association of Counties. Archived from the original on 2011-05-31. Retrieved June 7, 2011. 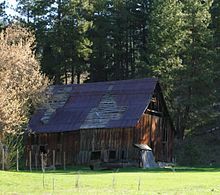 ^ "Milestones for Washington State History — Part 2: 1851 to 1900". HistoryLink.org. 2003-03-06. ^ McCormick, Ida Skarson (1999). "Links to Okanogan County, Washington". Archived from the original on 2006-05-05. ^ "American FactFinder". United States Census Bureau. Archived from the original on 2013-09-11. Retrieved May 14, 2011. This page was last edited on 23 April 2019, at 21:26 (UTC).